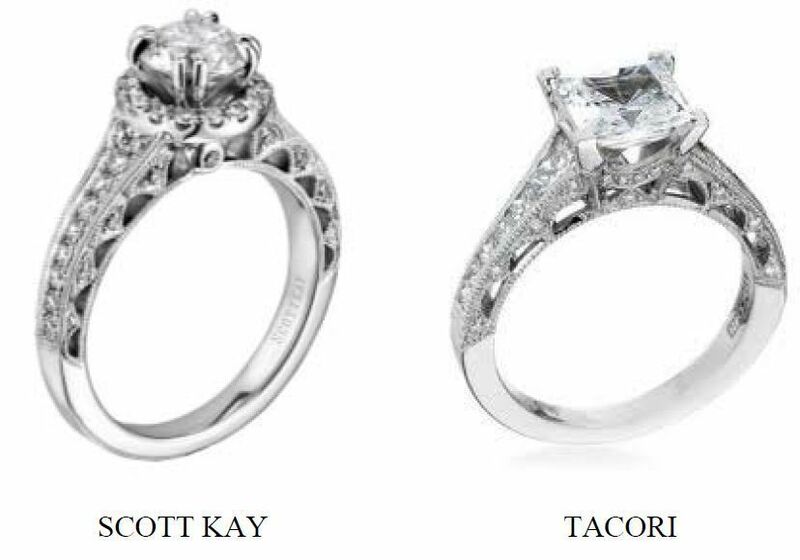 Tacori suffered another loss in its continuing copyright and trade dress infringement lawsuit against rival jewelry designer Scott Kay. The Court previously denied Tacori’s ex-parte application for a temporary restraining order, but that did not deter Tacori’s attempts to prevent Scott Kay’s sales of its Heaven’s Gate jewelry collection. 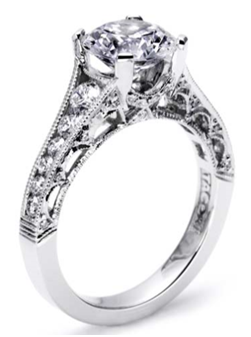 Not surprisingly, the Court denied Tacori’s preliminary injunction bid, which was now focused solely on the copyright issue. “A plaintiff seeking a preliminary injunction must establish that he is likely to succeed on the merits, that he is likely to suffer irreparable harm in the absence of preliminary relief, that the balance of equities tips in his favor, and that an injunction is in the public interest.” Winter v. Natural Res. Def. Council, 129 S. Ct. 365, 374 (2008). Although a plaintiff must make a showing on each factor, the Ninth Circuit employs a sliding scale approach where “a stronger showing of one element may offset a weaker showing of another.” Alliance for the Wild Rockies v. Cottrell, 632 F.3d 1127, 1131-35 (9th Cir. 2011). Thus, a preliminary injunction may still issue where there are “serious questions going to the merits and a balance of hardships that tips sharply towards the plaintiff . . . , so long as the plaintiff also shows that there is a likelihood of irreparable injury and that the injunction is in the public interest.” Id. at 1135 (internal quotation marks omitted). The Court found that Tacori may be able to meet “its low burden of establishing copyright ownership” because the “requisite level of creativity is extremely low.” In order to show copying, Tacori had to establish Scott Kay’s access to its reverse crescent design and that the Heaven’s Gates rings were substantially similar. Scott Kay admitted that it was aware of Tacori’s design, but the Court found that the parties’ respective designs were not substantially similar. Los Angeles, CA – Following the trend of fashion designers filing trade dress infringement lawsuits to protect designs not covered by copyright law, Jeffrey Campbell is suing Forever 21 for allegedly copying six shoe designs. Like Givenchy v. BCBG and Marc Jacobs v. Christian Audigier before it, Jeffrey Campbell is forced to use trade dress law to protect its designs because copyright law views fashion products, for example pursues and shoes, as useful articles that cannot be copyrighted. Unlike UGG, however, many fashion designers are unaware that fashion designs can be protected through design patents, which must be filed within one year of the design’s public disclosure. Without a design patent, Jeffrey Campbell must now attempt the tougher climb of proving trade dress infringement. Jeffrey Campbell claims that its shoe designs “have become the footwear brand to know in the United States” over the last ten years and that customers, based on extensive marketing and advertising, recognize the shoe designs as Jeffrey Campbell’s trade dress. Plaintiff contends that Forever 21, “having a business model that . . . focuses on selling knockoffs or cheaper copies of products designed by higher-end fashion companies,” has intentionally copied the Cast Sandal, 99 Boot, Splendid Sandal, City Wrap Boot, Alicia Fur Boot, and Swansong Sandal. Jeffrey Campbell also asserts that Forever 21’s intentional copying violates federal and state unfair competition laws. The amount of monetary damages are currently unknown to Plaintiff, but it is also seeking a permanent injunction to prevent Forever 21’s future sales of the shoe designs. The case is Jeffrey Campbell LLC v. Forever 21, Inc., CV11-04619 SJO (C.D. Cal. 2011). Los Angeles, CA – Tacori Enterprises sued Scott Kay for copyright and trade dress infringement over sales of jewelry incorporating a repeating crescent design. Tacori filed an ex parte application for a temporary restraining order to prevent further sales of Scott Kay’s Heaven’s Gate Collection that allegedly infringes Tacori’s purported copyrights and trade dress. Los Angeles, CA – San Antonio Winery filed a trademark and trade dress declaratory judgment action against Banfi Products. San Antonio’s Stella Rosa Imperiale Brachetto d’Acqui wine is made from Brachetto grapes that are sourced from the D.O.C.G. region of Brachetto d’Acqui. 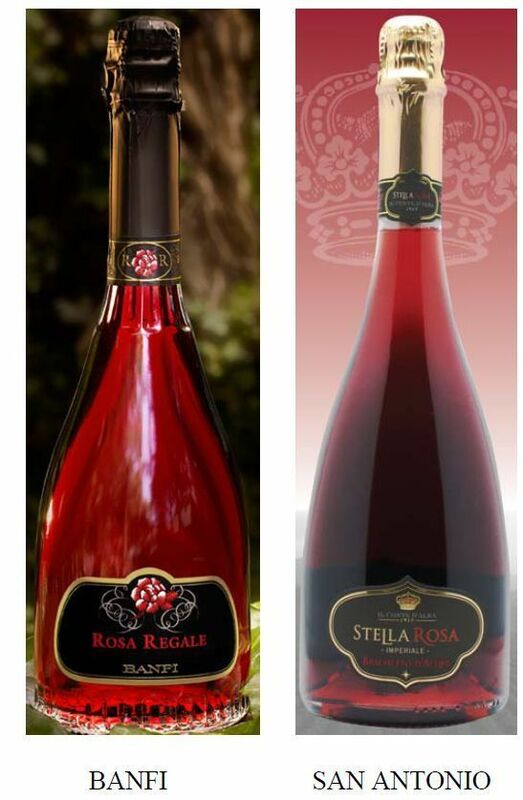 San Antonio has registered its Stella Rosa design trademark with the USPTO. Banfi’s Rosa Regale Brachetto d’Acqui wine is also made from Brachetto grapes sourced from the same region. San Antonio disagrees and seeks the Court’s ruling that its wine bottle “does not infringing any valid, enforceable trademark or trade dress rights of Banfi under any provisions of the Lanham Act or constitute unfair competition under any state unfair competition laws.” The case is San Antonio Winery, Inc. v. Banfi Products Corporation, CV10-9245 MMM (C.D. Cal. 2010). Los Angeles, CA – Givenchy, the luxury merchandise manufacturer, seems to be jumping on the trade dress bandwagon (see here and here) to prevent copying of its purse design. Instead of protecting its purse design with a design patent, Givenchy claims that its Nightingale Trade Dress “includes without limitation a removable strap, two double seemed handles, a flat bottom and decorative double stitched horizontal and vertical stripes on the exterior that visually separate the bag into four distinct quadrants.” Givenchy is going to have to show that the consuming public recognizes the trade dress as identifying the source of the purse. Givenchy claims that it has earned in excess of fifty (50) million dollars in revenue from the sale of the Nightingale handbags and that the public recognizes the trade dress. BCBG is accused of trying to profit from Givenchy’s goodwill by selling “its knock-off ‘Rembrandt’ and other handbags that deliberately copy, line-by-line and stitch-by-stitch distinctive, non-functional elements of Givenchy’s Nightingale Trade Dress.” In addition to monetary damages, Givenchy seeks an injunction prohibiting further sales of BCBG’s handbags. The case is Givenchy S.A. v. BCBG Max Azria Group, Inc. CV10-8394 (C.D. Cal. 2010). New York — Upper Deck will reportedly pay MLB a “substantial sum” in addition to $2.4 million to settle the trademark infringement and breach of contract lawsuit, according to Reuters. On January 31, 2010, Major League Baseball Properties sued the Upper Deck Company for trademark infringement, trademark dilution, unfair competition, and breach of contract because Upper Deck continued to print baseball trading cards after its license was terminated. Details blogged here. It appears that Upper Deck learned from its long and drawn out court battle with Konami. Only after the California District Court ruled that Upper Deck counterfeited hundreds of thousands of Yu-Gi-Oh! trading cards, did Upper Deck decide to settle on the first day of trial. Details here. Conversely, by settling early with MLB, Upper Deck can avoid possible adverse rulings and focus on reviving its business. 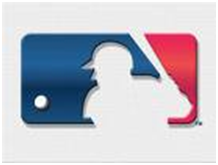 The case is Major League Baseball Properties, Inc. v. The Upper Deck Company, LLC, 10-cv-732-RWS (SDNY 2010). Car racing legend Carroll Shelby sued Factory Five Racing in California last year for trademark and trade dress infringement (details here). The District Court in Los Angeles granted Factory Five’s motion and transferred the case to Massachusetts (details here and here). The Massachusetts District Court has now dismissed Shelby’s Daytona Coupe trade dress action with prejudice (it cannot be re-filed) and has dismissed the rest of the complaint without prejudice. The Court, however, declined to dismiss Shelby’s lawsuit against co-defendant Internet Community Partners, LLC – doing business as ffcobra.com. (Order is available here). In this case, the settlement agreement resolved the Type 65 trade dress claims and did not bar FFR from using the Type 65 kits, which have apparently not broadened or changed in the intervening years. Under the settlement agreement, “Shelby dismisse[d] with prejudice all claims that have been asserted or could have been asserted relative to the trade dress or designs of FFR’s kits, including but not limited to the kits known as the 427 Roadster and the Type 65 Coupe.” (FFR’s Mem., Ex. B ¶ 9 (emphasis added).) Shelby’s argument that the first suit only involved the 427 S/C contradicts the plain language of the settlement, which dismissed all claims “relative to the trade dress or designs of FFR’s kits” involving Factory Five’s Type 65 Coupe, not merely those relating to the trade dress of the 427 S/C. Moreover, the Final Judgment included numerous, specific references to both the name and design of the Daytona Coupe. Los Angeles, CA – Designer Christian Audigier’s Nervous Tattoo, Inc. is being sued by Marc Jacobs’ company for trade dress and trademark infringement over purse designs. Marc Jacobs designs apparel and accessories, including purses, and has a pending application for its random “Marc Jacobs” scrambled trademark. Marc Jacobs has applied the scrambled trademark to the inside lining of the “Marc Jacobs Pretty Nylon” tote bag. And the tote bag’s “size, shape, color or color combinations, product design, texture, and selection and arrangement of materials and accessories” are claimed to serve as its trade dress. Plaintiffs accuse Defendants of selling tote bags that “bear trade dress that unlawfully copies or imitates Plaintiffs’ unique, distinctive, and non-functional Marc Jacobs Pretty Nylon Tote Trade Dress and/or that unlawfully bear marks confusingly similar to the Marc Jacobs Scrambled Trademark.” In addition, Plaintiffs assert claims for unfair competition under Cal. Bus. & Prof. Code § 17200 and constructive trust. Since the parties’ products apparently bear their respective trademarks, it will be interesting to see if customers are confused about the source of the products. See Bristol-Myers Squibb Co. v. McNeil-P.P.C., Inc., 973 F.2d 1033, 1045-46 (2nd Cir. 1992) (holding that prominently displayed trade names on the respective products “weigh[ed] heavily against a finding of consumer confusion resulting from the overall look of the packaging”) (preliminary injunction denied). Los Angeles, CA – UGG® boot manufacturer, Deckers Outdoor, filed a patent infringement and unfair competition lawsuit against Claire’s Stores and CBI Distributing. UGG® boots have set a fashion trend with young ladies wearing the lamb-skinned boots – to keep their feet and calves warm – with shorts, thereby allowing their knees and thighs to freeze. That’s not in the complaint, it’s just a personal observation. 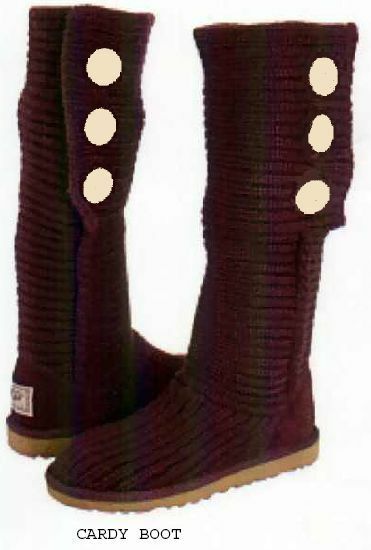 Now back to the regularly scheduled complaint: the UGG® line of boots includes the Classic Cardy™, which was introduced in 2007 and has a crochet upper with buttons on the lateral side. The Classic Cardy™ boot is the subject of U.S. Design Patent No. D582,650 (“the ‘650 Patent”). Deckers alleges that Defendants sell allegedly infringing boots under the “Claire’s Botts” mark at significantly lower price points, thereby diminishing the market place for the genuine Cardy Boots™. Plaintiff’s Lanham Act claim derives from the alleged sales of infringing boots creating a false association or affiliation with Deckers’ UGG® line of boots.